Used once as a mixer but never used to record. 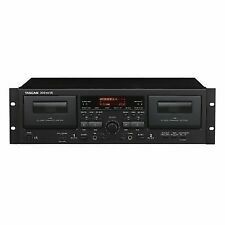 This Tascam 202 MKII Dual Deck Cassette Player & Recorder has given excellent service for many years. The Mic inputs were not tested. Electronic digital tape counter. Auto tape selection. A Technical friend of mine tested this out and was kind enough to print out the manual from website and this is included. Tascam Porta Studio 424. Good working condition. Main part only. We cannot take the responsibility for such cases. In Special playback mode, you can monitor the sound from one tape using headphones, while the other tape plays through the line outputs, making it easy to cue another tape. A noise-reduction feature (the equivalent of Dolby B) reduces hiss during playback. RTZ function and a repeat playback feature are provided, and you can increase or lower the pitch and tempo while playing back for Karaoke or sports applications. A microphone input on the front panel makes spontaneous recording (solo or mixed with a line level source or a cassette) convenient. Tascam Porta Studio 488. We cannot take the responsibility for such cases. This kit has been put together for users who are familiar with the service procedure of the Tascam cassette decks. This kit includes the following belts If you are in a remote area you may incur extra fees. If photographs don't provide enough proof then a video maybe required. I will do my best to resolve any situation. DON'T LET THIS GET AWAY! There is one knob missing. Collection can also be arranged from Forest Gate, London E7. Tascam Portastudio 424 mk III mark 3 - original box and unopened manual . Box is a little bit tatty. Manual is still in original cellophane. ●●● NO POWER SUPPLY ●●● Condition is Used but in excellent condition but as there is no power supply, it is being sold as For Parts or Not Working. Dispatched with eBay delivery – Shutl 2-3 days.